A reliable source for Mezzanine Construction information and a resource for accessing leading Mezzanine Construction and suppliers. 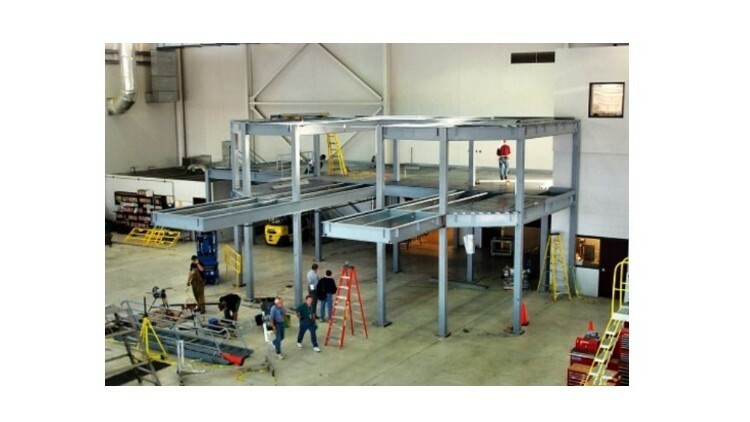 Mezzanine construction is the process of design, assembly and installation of mezzanine systems. Mezzanines are raised platforms that create extra workspace and storage space. In industrial settings like warehouses and factories, mezzanines allow for the storage of supplies and equipment, and they can also provide office space. Mezzanine construction companies offer a valuable service to industrial and commercial operations that require an expansion of their work or storage space. A company faces a few choices when it grows to the limits of its facility’s capacity: the company can move to a new facility, expand its current facility, accept the indefinite stagnation of its business or construct mezzanines (assuming it has not built them already). The purchase or construction of a new facility is expensive and time consuming. Mezzanine Construction Mezzanine construction is the process of design, assembly and installation of mezzanine systems. Mezzanines are raised platforms that create extra workspace and storage space. The most basic mezzanine design features a platform supported by columns. They can be designed in many shapes, constructed out of many materials and fitted with many accessories. Simple, free-standing square and rectangular mezzanines can be placed anywhere on a warehouse or factory floor while minimizing the impedance to movement below; these designs allow for easy and quick access to supplies (many prefabricated mezzanines are designed and used in this way). Other mezzanines can be built around the entire perimeter of a space to allow for easy personnel movement throughout a facility, for observation and even for visitor tours. Any number of grated or treaded stairs can be attached to allow for multiple access points. In applications where heavy items are stored or where machinery operates on mezzanine platforms, lifts and conveyors can be built into mezzanine systems, allowing for the safe and easy transportation of materials between the mezzanine and other levels. Some buildings can be designed to accommodate structural mezzanines, which are raised platforms that are integrated into building construction. These systems are usually designed for companies that anticipate the need for extra storage, workspace or observation platforms in advance of relocation or expansion.